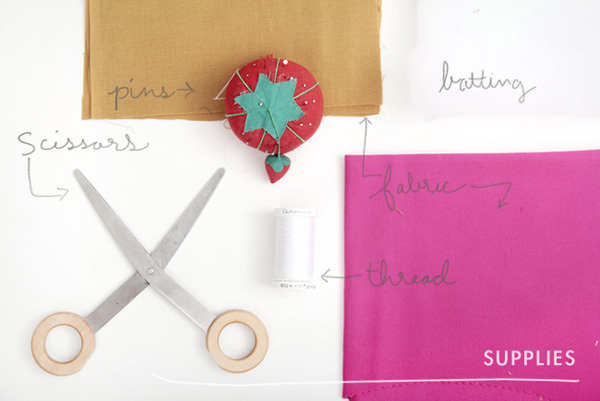 Do you have loads of fabric scraps haunting your memory and stealing all of your craft storage space? Oh… right… neither do I. Okay, okay! I do! Loads and loads! Sometimes I want to throw my monster fabric scrap collection into the trash, but I know how much I would miss the selection when I want to do small projects like this. 1.) Decide how large you want your hot pad to be. Maybe measure one you already own and like, and then add 1.5 inch to the height and width for seam allowance (1/2″ all around, including where your triangles will end up meeting), and make sure you find fabric scraps big enough to use. 2.) Cut two coordinating colors of fabric in the size you decided you need, making sure they’re exactly square (use a cutting mat or a paper template if necessary) and the same size. 3.) 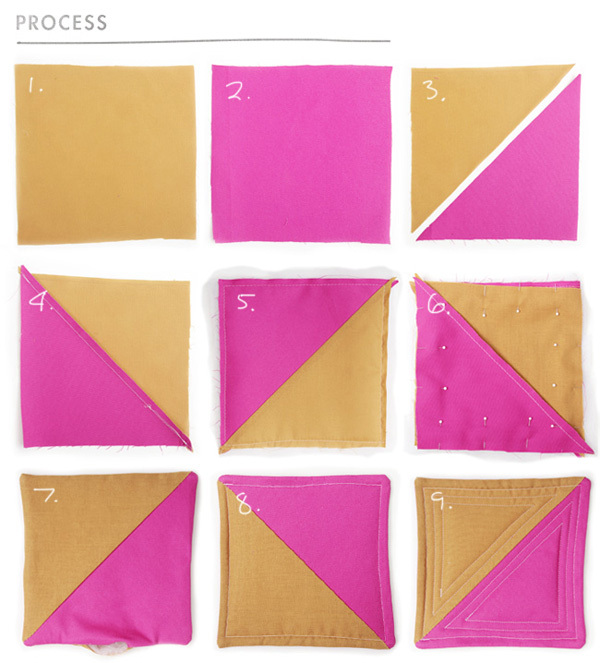 Fold your fabric squares on the diagonal, and slice them in half with sharp fabric scissors. Just like a grilled cheese sandwich! 4.) Placing the right sides of the fabric together, stitch together one triangle of each color, with the longer sides being joined together, 1/2″ from the edge. Iron flat the seam if you like (I did!). Do this to all four triangles, creating 2 squares. 5.) 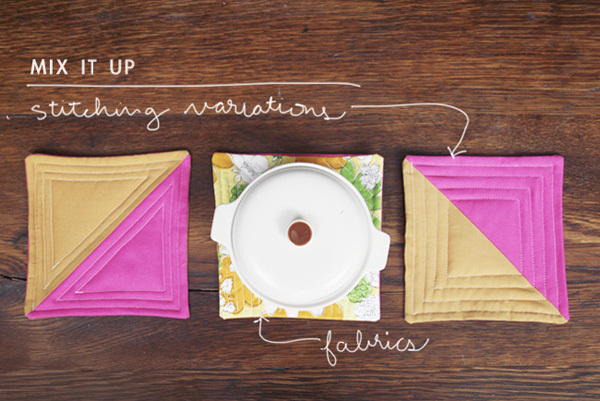 Cut out a square of thin quilt batting fabric to the size of your stitched-together square. Then, stitch the batting to the wrong side of one of your squares, 1/4″ from the edge. 6.) Place the right side (not the batting side) of the square you’ve just made to the right side of your remaining fabric square (this will leave the batting on the outside), and pin together the two squares to make sure they don’t shift while sewing. Now, stitch together 1/2″ from the edge of your squares, leaving a couple of inches open on one of the sides, so you can then flip the squares right-side-out. 7.) Now, flip the squares right side out through the hole you have left, using a pen tip or some kind of long, thin object to properly push out the corners. You’ll have that 1-2 inch section that is still open, but we’ll take care of that in the next step. 8.) Now, time for quilting! Start the lines of your quilted hot pad as a 1/4″ border around the edge. Make sure the unsewn, open portion of your edge is flipped inward like the rest of the hem (use pins to secure if need be), so that when you stitch around the border, the opening is sewn shut. 9.) 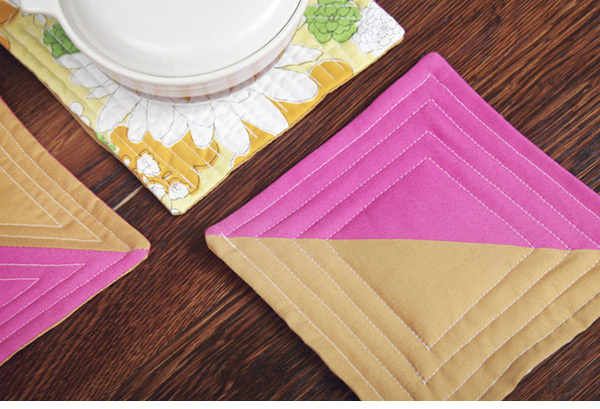 After sewing a border around the edge, you can stitch a pattern however you like on your hot pad! I tried a few different patterns, but I think my favorite is the concentric squares that leave one big square in the center (see image directly below). I would just add, make sure that your batting is the heat resistant kind, or layer up 100% cotton batting, or use wool(which I’ve found to be the best)I have tried to just use poly and that’s not good, it conducts the heat and it melted my pad, BOO!!! Unless you just don’t want to set anything hot on them. I like that you used different stitching patterns on them, makes em more arty. These are lovely. IMHO you should use Thermolam as the batting as it is heat-resistant. Especially important if you’re going to remove hot things from the oven or put really hot things on your good table. 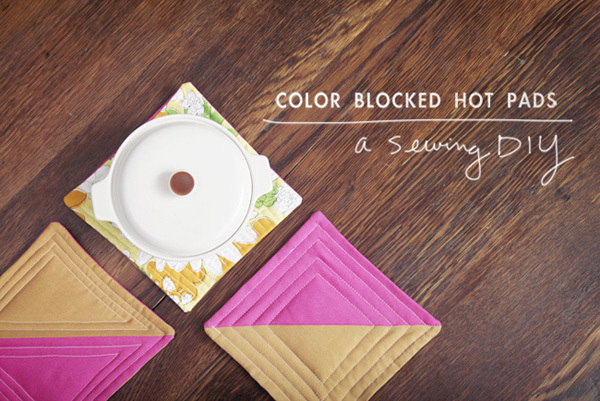 You can make half-a-dozen mini hotpads as a set of coasters, too!